Hey all, I created a userscript for people who are constantly switching courses on DuoLingo from different source languages. I only created this today so might not be perfect and I would love if someone could redesign the dropdown in the form of a grid as apposed to a list and build the css. The script has an updated version by someone else (see https://github.com/arekolek/DuolingoCourseSwitcher) which brings the script up-to-date with how Duolingo works right now and fixes a lot of other things as well. Can you tell me who updated this script? I have a suggestion / request. Thanks. This is great, saves my time! Enjoy five lingots as a token of appreciation! Thanks jitengore :) Glad you find it useful! Have another lingot. Thanks a lot, Andrew! It's very nice, I love it. Thanks! I know some css. How do you envision the grid? Do you still want the hover revealing the secondary options? Also, is it possible to only show the courses you have signed up for or would that be too difficult to code? So rather than a long list, I was thinking of 3 columns of langauges in a white box. On my laptop the list currently runs off the bottom. Also my css seems to screw up the flags on hover, and they are all placed on top of eachother. 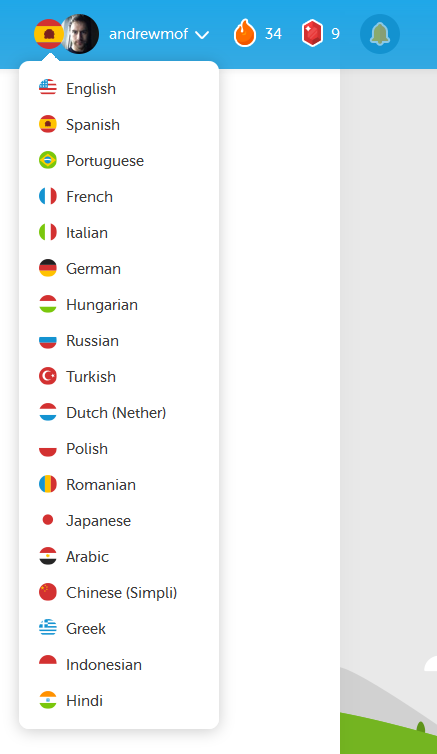 Yes its possible to only show the languages you are learning but not automatically, the user would have to manually select which language combinations to show in a settings window. Would that be more appealing for people? Aww... selecting languages would be perfect! And it would also make the list shorter. Is it possible to design an MRU kind of functionality? - Most recently used at the top followed by a line and all the rest in alphabetical order or popularity order below the line? If you take a look at the source code, you can basically edit line 26 to include and exclude the languages that you want. Nevertheless, it's still buggy as I can't get it to switch to dutch. (neither as source nor target language). It would also be nice if it still included the old link "Add a new course". Right now the only way to get there seems to be disabling the plugin first or knowing the url by heart. I agree that Duo should defiitely add a function like this to its normal interface. You sir are awesome! Thanks for sharing this. I agree it would be nicer to have aviable only those in which we have active courses to reduce the list. This could be used if your target language is off the bottom of the screen too - just delete a few options you don't use and the list will shorten! Thanks! And that's brilliant, I didn't even think of adding stuff! Thanks a million, only issue I'm having now is not all the flags are loading and the ones that do are wrong. But still loving this plugin. I would love if DL made this official. I believe is the best and easiest method for changing languages! Thanks again. Hi. I love this, however it doesn't have the latest languages, so I can't get to my Irish course. I guess I can enable/disable it as required. Edit: Thanks to lucie.white's post below, I've now been able to add courses which were missing. Thanks a million for this tool. Any chance of an update for the latest beta languages like dutch from english? How do I do it? I clicked install but just a bunch of computer programming stuff appeared' what happened? Hi. Did you first install the appropriate extension to your browser? I use Firefox, so I added Greasemonkey (Installing, Step 1). I then installed the userscript (Installing, Step 2). 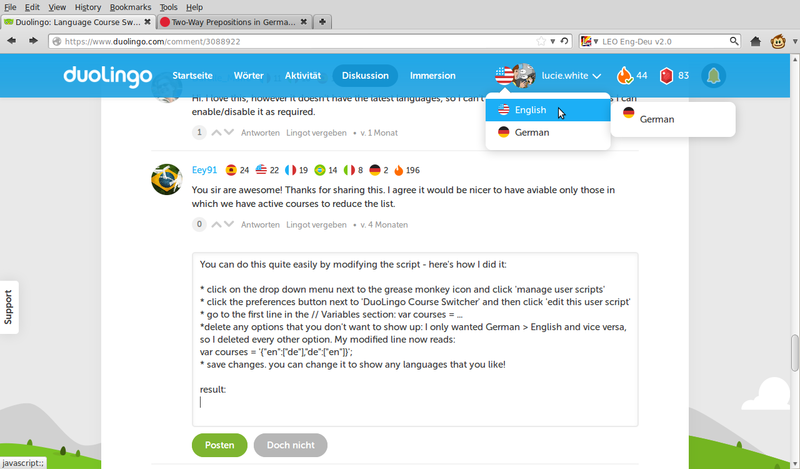 Once installed, in Firefox, you can enable/disable it via Tools > Greasemonkey > DuoLingo Course Switcher. If you got anything at all to download you did better than me. I assume from all the geek talk about this script that it was made extremely difficult to install because it is even more difficult to operate. I'm not a coder so the choice to make the script impossible to get probably saved me a lot of grief. This sounds like a great addition. However, after installing it (and Tampermonkey for Chrome), the links in the drop-down don't seem to work. It just stays on the same page when I click on a course. Any ideas what's gone wrong? Did you find the solution? I'm having the same issue. edit: The version linked at the top of this discussion is faulty, it should be https://github.com/arekolek/DuolingoCourseSwitcher , which worked for me after switching one more time the old way. Sadly, this doesn't work any more. Is there a way to switch between courses such as English to French, French to English, Portuguese to Spanish, Polish to English, etc? Wow, that sounds like it would save a lot of people a lot of time. I will definitely try this out, that's awesome! Thank you very much for sharing this! This is great, and I really appreciate the effort you put into making this. However, the language I want to study is Vietnamese to English and currently the list runs off at the bottom..... Can you or anyone else fix this? Great! I use it with Greasemonkey, thanks! I'm a big fan of this userscript! Thanks for your hard work andrew :) It's still got some glitches, but it serves the purpose very satisfactorily! Help! Somehow my homepage is in Russian, which I cannot read at all. How do I get it back into English? Go into the language selection place and click "add a new course" (actually in Russian, but it should be at the bottom of the list). Then, select that you speak all languages and then choose a course from English. This is absolutely wonderful - thank you so much!! Also: I believe the language code for Dutch should be "dn" instead of "nl-NL". The former works for me, the latter doesn't. The script is updated by someone else (see https://github.com/arekolek/DuolingoCourseSwitcher) which fixes these things and a lot more. Great, thanks for the link! I had fixed the most pressing issues myself but the updated script is much better. Thanks man, I love that. [Userscript - new webversion]Course Switcher to any course+list all phases courses+link to last WIS.